I have been studying and writing about apparitions and mystics for over 40 years now. I have personally met five mystics who have had true mystical experiences, two from God and three from demonic sources. I wrote the first book on one of these mystics and the only book approved by the bishop. It was because of Padre Pio and Fatima that I came back to the Church and from exorcisms and mystics that I learned to know the true from the false regarding revelations. True apparitions and mystics do not give any new knowledge to the deposit of faith but sometimes they do give better understanding, proof, and devotion to what we should already know. Guadalupe supported the Church against the Protestant Reformation and Martin Luther. Bernadette of Lourdes supported a controversial doctrine given earlier by the Holy Father regarding the Immaculate Conception and proved it with miracles. Our Lady of Fatima came to warn us and save us from Communism. Padre Pio came to give us greater devotion to Christ in the Mass and understanding of need for Confession. Tre Fountain was heaven’s way of teaching the errors of Protestantism. One of these mystics was Anne Catherine Emmerich, now Blessed, who God used to counter Nazism, Secularism, Evolution, Atheism, and Agnosticism. Because she came at a critical time in history of the many false Philosophies of the time, she needed to be armed by God with the most evidence of the truth she would communicate. Atheism and Communism were spreading throughout the world from the Latin Quarter of France and thanks to the printing press it covered the world quickly. Solid evidence against these trends was needed in the world backed by proof of their validity. To support the infallibility and historicity of the Bible and the unity of the Catholic Church, God chose a woman who could not read or write. She was able to become a nun simply because she could play the organ and the convent needed an organist. In the convent she was the wash woman and organist. Soon after God sent to her (guides) Guardian Angels to take her back in time with visions and teachings so that she understood the creation, test and fall of the Bad Angels, the reason for the creation of the world, the fall of man, and his redemption. Almost every mystery of the Bible was explained to her and she saw details that are not found in the bible. She even saw the details of the clothes people wore, the symbolisms of the events, and the meaning of each historical event. When the time came for her to write all this down God sent to her, The Pilgrim, as she called him. Brentano was one of the best writers of the time, but he had drifted away from the Church and was becoming a Pluralist. Listening to and writing down Emmerich’s visions, sometimes as they were happening, Brentano converted back to the faith and became her biggest advocate. He wrote volumes and volumes of her revelations until they covered every shelf and table of his home. Today, after 150 years, only a small portion of Emmerich’s revelations have been published and in English those can be purchased at Tan Books and Publishing. For those who have read them and forgotten them I plead with you to do as I have, read them over and over again. When I study the Bible I read it with the Fundamentals of Catholic Doctrine, a Bible Dictionary - Thesauruses, a Greek – English translator, and Emmerich’s books. Nothing has given me more understanding of the historicity and truth of the Bible than Emmerich, and the Early Church Fathers. What Emmerich did for me the most was take away all doubt regarding the Bible and the Church. God backed up her revelations with one of the most documented stigmatas in history, with short term prophesies, with miraculous cures, reading and understanding the minds and souls of others, discernment of true and false relics, and revelations of the locations of things and places lost to archeologists. She saw visions of the future with its blessings and curses. Using the revelations of Emmerich, Heinrich Schliemann discovered the Chaldean’s City of Ur. Using the books of Emmerich over a 100 years after her death two Lazarist priests from Smyrna, Fathers Poulin and Yung, determined to check the authenticity of Sister Emmerich. Emmerich had described the exact location of Our Lady’s house in Ephesus and her death and bodily resurrection from that place. Every detail was given in her revelations, to the location, to its size, its interior, a cave next to it, the stations of the Cross John built for Her, the later Basilica built for Her there, the cave of John’s death and his Basilica, all in Ephesus. After five days' search in the mountains south of the ancient city the two priests were led by some natives of the region to a small ruined building near the summit of an isolated peak. The site and the plan of the house corresponded accurately to Sister Emmerich's description (See Vol. IV, pp. 451-455). 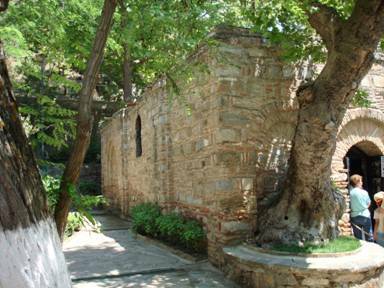 The explorers learned that the place had been locally venerated since time immemorial by villagers descended from the early Christians of Ephesus, who called it Panaya Kapulu, "The House of the Holy Virgin", and who made annual pilgrimages there on the Feast of the Assumption. Later two Americans, a husband and wife, rebuilt the house back to its original form as described by Emmerich. House of Our Lady in Ephesus today. Ephesus became, in fact, the great Marian city of the primitive Church, the site of the earliest known basilica built in honor of the Mother of God. In this same church the Council of Ephesus (431) defined the first Marian dogma, that of the Theotokos or Divine Maternity. During the 63 years since the discovery many archaeological investigations as well as several new discoveries in the neighborhood have confirmed the authenticity of Panaya Kapulu. Not far from the house the Christian cave-settlement and the ruins of the palace described by Sister Emmerich have also been found. In 1954 the Little Brothers of Jesus accepted the post of serving at Panaya Kapulu, now known as the Shrine of Our Lady of the Assumption. When the Christians were driven from Jerusalem, St. John came to Ephesus together with the Blessed Virgin Mary and Mary Magdalene. A large group of Christian people came with them. St. John settled in Ephesus. He did not move from there, except when he was forced to go in exile on the nearby island of Patmios. Thus, Ephesus and Asia Minor became the very place where the Apostles and the first Christians, after having left the Holy Land, reorganized their forces and prepared themselves for their apostolate to the West. The body of St. John was not found. The Manna became since then the main characteristic of the Apostle's tomb. Every now and then, it was reported, the Manna came out from the tomb. The body of St. Mary Magdalene was transferred from Ephesus to France. The Basilica of Saint John, in its full length of 428 feet, occupies the entire width of the hill at that place, and, like all oriental Churches have to be built, covers exactly the axis East-West making thus, with the length of the hill, a geometrically perfect right angle of 45 degrees. St. Mary's Basilica at Ephesus is some 857 feet long. Then it was that the Blessed Virgin who until that time had dwelt in the small house near the Crenaculum and in Bethania, allowed herself to be conducted by John to the region of Ephesus, where the Christians had already made settlements. After Mary had lived three years in the settlement near Ephesus she visited Jerusalem with John and Peter. Several Apostles were there assembled. It was the first Council, and Mary assisted the Apostles with her advice. A year and a half before her death, she made one more journey from Ephesus to Jerusalem, and She again visited the Holy Places. She was unspeakably sorrowful, and Her companions thought her dying. When She recovered sufficient strength, She journeyed back to Ephesus where, a year and a half later, She did indeed die. The tomb prepared for her on Mount Olivet was ever after held in reverence, and at a later period a church was built over it. This is why some did not believe Emmerich’s vision that Mary lived and died in Ephesus. Nobody seems to have noticed that Emmerich also describes the exact location of a treasure in the walls of Santa Maria Maggiore (Rome): relics, writings from the first Christians and the original painting of the Virgin by Saint Luke (miraculously finished).Emmerich also describes a real treasure in a Judean city in Ethiopia which, so far has not been discovered. Emmerick gives a detailed map of Jerusalem and places where Jesus had traveled. She also gives hints to the exact location of important places and relics. A Benedictine priest at the D.C. Abbey of St. Anselm, following Emmerich’s writings, discovered new sites in the Holy Land as she described them. Emmerich's calendar system plotted Julian, Gregorian, Roman and Jewish calendars against astronomical data: I am sure that all the dates and moon phases she gives align perfectly, something really hard in our time and quite impossible in her time. A study of this would give us exact dates of the important Catholic feasts (Immaculate Conception, Incarnation, Nativity, etc.). Consider that Emmerich describes in detail the story of hundreds of relics and the locations of religious treasures such as: The Holy Grail, Lignum Crucis, Crown of thorns and nails used in the Crucifixion, The sacred spear, Hair of Blessed Virgin Mary, Hand of Blessed Virgin Mary stamped in the rock, Stone miraculously engraved in Saint Peter’s, Nuptial ring of Blessed Virgin Mary, House of the Sacred Family, House of Saint John and Mary in Ephesus, Miraculous spring/fountain asked by our Mother in Egypt, Miraculous paintings and images of our Lord and our Mother, House of Saint Peter, House of Saint Paul, Body and head of John the Baptist, Body of Saint Catherine stamped in the rock, Arc of the Covenant and hundreds of etc. Each relic and place can be directly linked to a Bible passage or Tradition and will raise more trust in the scriptures, the Church, as well as Emmerick/Brentano writings. All or most of the above could be found just by studying the writings of Emmerich. Consider that almost every apparition has one or more web sites promoting it but Emmerich has none. Organizations have grown up to promote Fatima, like the Legion of Mary, the Blue Army, the International Apostolate of Fatima, etc. but none for Emmerich. We have the Spiritual Children of Padre Pio, but nothing for Emmerich. We have new religious orders for some saints but none for Emmerich. We have over 100 web sites for Medjugorje but none for Emmerich. It is sad that there is no real promotion or organization or even a web site for Emmerich’s writings because resurrecting Emmerich’s theological message will have a great impact on: The appreciation of the Catholic Church’s tradition in interpreting the Bible, The appreciation of images and relics as channels of especial blessings; The answers to questions such as: If God loves us, why did He wait thousands of years to incarnate and leave us the Sacraments? Why wasn’t Virgin Mary the grand daughter of Eve? Why did Mary deserve to be chosen among all women? Why is it fair that God chose the Jews, while discriminating the rest? Why is Latin so important to the Church? Why is prayer, penance and mercy, for the love of God, essential to salvation? Why should we trust the Gospels? Emmerick determines the location, date, author and circumstances related to their writing. Why is The Da Vinci Code wrong on issues like Trinity, priesthood, Mary Magdalene, celibacy, etc.? Emmerich gives a detailed account of unknown facts about the life of Jesus (including childhood), our Blessed Mother, Saint Joseph, the apostles, the first martyrs and saints, Mary Magdalene, Lazarus, etc., not to mention the passion of Christ. Consider what just one man did in making a movie of the passion of Christ inspired by the writings of Anne Catherine Emmerich. It influenced the entire world and brought faith back to millions. Who knows how many souls were saved by this movie. What more could be done if she were promoted properly? 3. The rent or purchase a machine to scan the walls of Santa Maria Maggiore, if the research of point 2 proves trustworthy. 6. Start a website dedicated to Blessed Anne Catherine Emmerick in many languages. 8. Find the secret passages in Troy, Ur, Jerusalem, Ethiopia, etc. 10. Starting with Emmerick/Brentano complete writings by scanning the books and posting them on the net so that hundreds of volunteers will start a treasure hunt by identifying the relics and locate the ones already discovered while pointing out the ones to be discovered (some relics are venerated but the story about them have been forgotten). The entire purpose of this Newsletter is to resurrect interest and study of the life and writings of Anne Catherine Emmerich, the greatest mystic of our time and maybe the greatest mystic of all times. God used her to resurrect faith in the bible and the Church and reveal hidden meanings to bible passages, archeological locations and proof of these things. In spite of 30 years of study on Emmerich, I am not the best person for this, but I do know those people who can do it. There are people in South America, Germany, France and America who if working together could shock the world with their findings and insights to the mysteries of God revealed to Emmerich. I am using this Newsletter to get them involved and to try and bring them together. I will co-ordinate dialogue between these people and then fade into the background so that they can do their work. I want to see a massive web site on Emmerich and I do mean massive because the extent of her information is unbelievable. Books could be written on just the first page of her revelations. Video documentaries should be done on her life, maybe even a movie. Video documentaries should be done on her archeological revelations. Art works should be done on her descriptions of the Holy Grail, the Ark of the Covenant, the Crucifixion (not well done in Mel Gibson’s Passion), and many other things that will help our image of Bible passages. You can see even in my poor sculpture that there is a great difference between what we see in crucifixes and the true crucifixion. But this revelation of Emmerich verifies the Shroud of Turin and the passages of the Old and New Testaments. It also reconciles medical science because it shows that being pierced in the hands would hold the body of Christ since the weight would be on the elbows an not on the hands. This is just one example of how Emmerich’s revelations remove confusion in Bible passages and perception of things. Help me resurrect interest in Emmerich and bring greater glory to God in these times and even greater understanding of the future of the Church from now to the end of time. Many of us owe to Padre Pio the fact that we are and have stayed Catholic. I have studied the stigmata of over 300 stigmatists. I have in our office a life-size picture of the Shroud of Turin. I studied all the books of the Shroud. It is from the scientific evidence of the Shroud and the 360 stigmatists throughout history that made me dubious, to say the least, about Gino. First of all, I studied all the doctors’ reports about the Shroud of Turin. We know that it was the common practice of Romans to nail in the wrists. We know that the Shroud has a large blood-clot on the wrist. We also read that it was the doctors’ conclusion that Christ was nailed in the wrists. But we also know the Scriptures. In the Hebrew, Aramaic, and Latin languages there are distinct words for wrist and hand, and yet John 20:27 and Psalm 21:17 reads "hands". In the Greek the word hand includes wrist. But if you go back to the Old Testament in Hebrew, the word is always "hand". You must also be impressed by the fact that all the 360 stigmatists in history, not only had the stigmata in the hands but also had them in the same way, not round but three edged. We are also aware of many false stigmatists, like Magdalen of the Cross in the 16th Century, who not only fooled the hundreds of priests and nuns she lived with, but fooled her own bishop. Only exorcism saved her soul at the last year of her life. 3) The wounds do not become infected, and the blood which flows from them is pure, while the slightest natural lesion in some other part of the body develops pus ... etc." "Jesus was now stretched on the cross by the executioners. He had lain Himself upon it; but they pushed Him lower down into the hollow places, rudely drew His right hand to the hole for the nail in the right arm of the cross and tied His wrist fast. One knelt on His sacred breast and held the closing HAND flat; another placed the long, thick nail, which had been filed to a sharp point, upon the PALM OF HIS SACRED HAND, and struck furious blows with the iron hammer. "A sweet, clear, spasmodic cry of anguish broke from the Lord's lips, and His blood spurted out upon the arms of the executioners. The muscles and ligaments of THE HAND had been torn by the THREE-EDGED NAIL, driven into the narrow hole. "After nailing Our Lord's right hand, the crucifiers found that His left, which also was fastened to the cross-piece, did not reach to the hole made for the nail, for they had bored a good two inches from the finger tips. They consequently unbound Jesus' arm from the cross, wound cords around it and, with their feet supported firmly against the cross, pulled it forward until the hand reached the hole. Now, kneeling on the arm and breast of the Lord, they fastened the arm again on the beam, and hammered the second nail through the left HAND." "The policemen then throw the Savior down onto the cross and bind him tightly around the hips. Then they tie his right arm tightly against the crossbeam, close to the WRIST, and drive a nail through his right HAND into the prepared hole. When they come to the left hand, they find that the hole had been bored too far out. They tie a rope around his WRIST, and while one of them kneels on his right arm, the others pull until his hand reaches the hole. In performing this operation they wrench his arm out of the shoulder socket. Then this arm too is tied tight to the wood and the nail is driven through the HAND. Therese can hear the individual blows of the hammer. Every time the nail bites into the hand, she jerks her knees up under the covers. From the wounds and the marks of the stigma fresh blood flows. Her fingers, curved inward over her PALMS, are moving convulsively throughout the vision ... Meantime, rivulets of blood have been flowing FROM THE STIGMA ON THE INNER AND OUTER SURFACE OF THE HANDS, COMING TOGETHER IN THE VICINITY OF THE WRISTS AND DRYING THERE." Now let us look at the Shroud of Turin keeping in mind that both seers saw the cross-beams up in the shape of a "Y", the hands tied at the wrists, and nailed in the hands. Also keep in mind the way the blood flowed on Neumann's hands [from the palm to the wrist]. The shroud shows a small blood clot on the back of the palm of the hand, then a line of blood to the wrist and a large blood clot on the wrist. Not only that, but there is a long blood clot down the arm. This blood is straight on one side and jagged on the other. In 1982 I started doubting Gino. We studied Emmerich, Neumann and the Shroud. 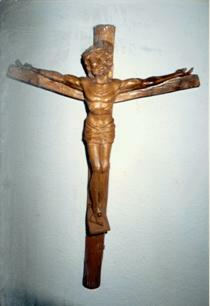 I made crucifixes in clay, in wood, and even put live people on a cross to see if what the mystics said could be true. Then I knew. IT WAS NOT POSSIBLE FOR OUR LORD TO HAVE BEEN NAILED IN THE WRISTS. If the cross-beams were straight as most crucifixes show, and He was nailed in the wrists, the blood would flow from the wrist down--not towards the hand. If, however, He was nailed in the hand and tied at the wrist with the cross-beams up, the blood would flow from the hand to the rope at the wrist and coagulate there. Then there is the problem of the stain on the arm. The only way that blood stain could have occurred is if His arm was tied tightly to the beam. Then the blood would flow down the arm in the shape of a "V" between the arm and the beam. It would be straight on one side [the side where the arm and beam come together] and irregular on the other. If, however, his hands and arms were on the top of the side beams and tied only at the wrists, it could easily hold all His weight and account for the arm blood stain. True science must take into account all observable facts. The blood stain in the hand and the "V" stain on the arm leave no other conclusion. Before we go on we must establish that the Holy Shroud of Turin is really the cloth that was wrapped around Christ at His death. You may remember that it was dated using the Carbon 14 dating method and was found to be only 500 years old. Even the Vatican said that if the Carbon 14 method was correct, it is not the Shroud of Christ. Here are the facts compiled from the investigation of "The Catholic Counter-Reformation of the Twentieth Century", and published in April 1991. In 1981, "the Shroud of Turin Research Project" published in detail their main conclusions. Not the least trace of paint had been detected on the Shroud, but instead the cloth had been stained with real human blood from a real human body which had suffered all the torments of Christ's Passion. The markings composing the image had been scorched onto the cloth in an instant of most intense heat from a body which was, temporarily at least, weightless! On the basis of the 48 classes of pollen tested on the Shroud, the team affirmed that the linen cloth dated back to Palestine 2,000 years ago. The team of "the Shroud of Turin Research Project" had taken the first steps (in 1979) towards gaining authorization for a radiocarbon dating of the Holy Shroud. On the 18th of March 1983, the Shroud's owner, Umberto II, the exiled King of Italy, died, bequeathing the Shroud to the Holy See. Pope John Paul II appointed the Archbishop of Turin as the Shroud's Pontifical Custodian. No doubt that the Shroud of Turin Research Project’s findings made the same reaction with anti-Christian scientists that the finding of Noah’s Ark did. They determined that, at any cost, the findings must be discredited. But how? They needed a fraud like the "Piltdown Man". It was decided that this would best be done by giving it radiocarbon dating, but not by the same research team. With an "authoritative" dating, the Shroud could be changed overnight into just another scandal. The task then was to get control of that project away from the research team, to get the desired result. In July 1982 the Trustees of the British Museum placed Dr. Michael Tite, Director of the Museum's Research Laboratory, in charge of their campaign to "get" the Shroud. They convinced the Vatican that they and they alone would do the dating, leaving the Research team out in the cold. Even the Vatican Scientific team was not allowed in the project. How they convinced the Vatican of this is another story involving a Cardinal. Dr. Tite then went about looking for a piece of cloth from the 14th century to be used in the fraud. With the help of Dr. Evin, they pulled some tufts out of a cape worn by St. Louis. "Cleopatra's mummy" (in fact the Shroud) was dated by the three laboratories, at 9 B C to 78 A D. The forged piece, (now called the Shroud) dated between 1300 and 1400 A D.
On 13 October 1988 Cardinal Ballestrero announced that the Shroud had been shown by radiocarbon dating to be a forgery. Condensed from the writings of D. J. McDonnell. "Pilgrim, If the Catholic Church was reduced to only one person, and that person was the Holy Father, it would still be the one and only Church of Christ on earth."